From Bandai Hobby. 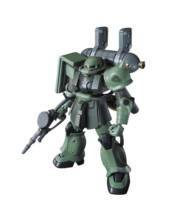 The Zaku I as it appears in the Gundam Thunderbolt anime comes equipped with a plethora of weapons including machine gun, 2 types of bazookas, heat hawk, flare bombs, and sub-arms. Interchangeable hands are also provided and can be used with the Big Gun unit that comes with the HG Thunderbolt Zaku 2 with Big Gun set, 11 Runners, 1 Marking Sticker, 1 Foil Sticker, and an Instruction Manual. Approximately 5' tall.